Plus a motivated seller who is looking to buy a smaller boat soon. THIS IS THE ONLY POST ON THE MARKET WITH UPDATED ELECTRONIC CONTROLLED CUMMINS POWER! NEW ENGINES, SHAFTS, PROPS, WERE INSTALLED IN MAY 2004. THAT SAME YEAR SHE WAS AWLGRIPPED,HAD A NEW HARD TOP INSTALLED, THE OUTRIGGERS REMOVED, NEW ALUMINUM BOW RAILS INSTALLED. THIS BOAT LOOKS MUCH MORE MODERN THAN HER AGE DUE TO THE INSTALLATION OF FRAMLESS SIDE WINDOWS WITH CUSTOM INTERIOR WOODWORK THAT PERFECTLY MATCHES THE INTERIOR ($10,000), PAINT, TEAK REMOVED, CUSTOM HARD TOP, ALUMINUM BOW RAILS, BOWMAR HATCHES, NEW FLYBRIDGE ENCLOSURE, AND LIGHTER COLOR. ADDITIONAL UPGRADES INCLUDE, NEW GARMIN ELECTRONIC PACKAGE (May 2017), NEW FLYBRIDGE LADDER, , WAVE WIFI ROGUE WIFI SYSTEM, UPDATED ONAN 8KW GENERATOR, BLACK WATER TANK,, NEW SALON OVERHEAD, WATERMAKER, A NEWER SUNSHADE FRAME, ALONG WITH MANY OTHER SMALLER UPGRADES. A SATELLITE DISH IS CONVEYING WITH THE VESSEL AND REQUIRES ONLY A MOUNT TO MAKE IT WORK. IF YOU ARE LOOKING FOR A GREAT CLASSIC BOAT WITH MODERN POWER, LOOK NO FURTHER! THIS BOAT SIPS FUEL CRUISING AROUND 24 KNOTS, AND HAS A TOP END OF 29 KNOTS. 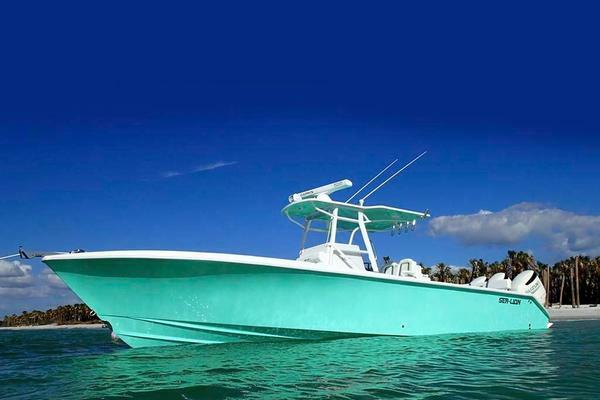 This boat has been fished very lightly and has been outfitted for Bahamas cruising. West Florida Yachts would love to guide you through a personal showing of this 46' Post Cummins QSM 11’S 1980. This yacht for sale is located in Destin, Florida and priced at $148,000. For a showing please contact us by filling out the form on this page and we will get back to you shortly! What extinguishes the Post 46 from other builders is the quality joiner work and furnishings. This Post is no exception. Throughout the 46's richly appointed interior, designer fabrics serve to accent the exquisite cabinetry. This boat has the original 46 floor plan with a large salon, a dinette forward and down to port and the galley forward of the dinette. The master stateroom is across from the galley and has bunk beds forward. Entering through a sliding door offset to Starboard, there is no smell, and the woodwork is in great condition. The large seamless windows let in plenty of light, and the custom matched woodwork around them appear to be original, obviously without the typical stain marks of water leaks found around most windows of yachts this age. The carpet has been updated to calm blue color. Port is a white leather L- shaped couch. There are two chairs and a custom teak high low table on the Starboard Salon and forward of the chairs is a full wet bar. The master suite features a full-size island berth with storage drawers below and cabinets above, cedar-lined hanging lockers, a large screened hatch overhead. The comfortable guest quarters are in the bow and feature over and under bunks, a hanging locker, and a large screened hatch. Each Stateroom has a separate head with an adjoining shower. The 46's functional galley includes a three-burner electric range, microwave oven, a full size refrigerator - freezer with ice maker, exhaust fan, parquet flooring, and more than ample storage. This Post has been completely refurbished over the past few years starting with installing Cummins QSM11 535hp engines and ZF Transmissions. Intellian i4 satellite TV comes with the boat only needing a bracket to install it. The owner of this wonderfully restored "resto-mod' boat is including a fairly new frame for an aft deck sun shade. He is also including an Intellian 4 satellite dish that only needs a mount to be installed. Of further value to her new owner, is that her owner can include a new, in the box, set of Glendinning electronic controls for the engines and clutches, depending on the offer. This boat is being offered at well below what you could buy a boat for and do all of this work yourself. PLUS, all the work is done. All the heavy (and expensive) upgrades and restoration has been completed to a professional level. You will not be disappointed when you come to see her. 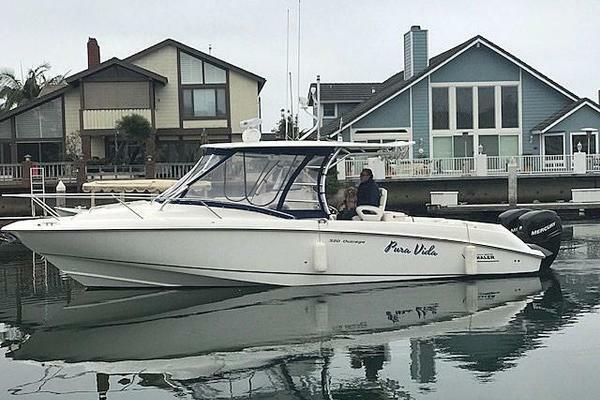 This knowledgeable owner is looking to move into an express or an open fisherman and is not getting out of boating.